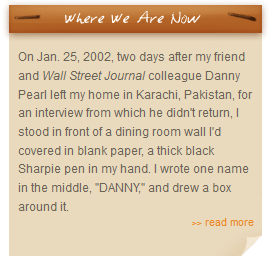 The Pearl Project released its findings on the kidnapping and murder of Wall Street Journal reporter Daniel Pearl. Read The Truth Left Behind: Inside the Kidnapping and Murder of Daniel Pearl. To view press coverage of the report, visit the Press Page. The Pearl Project developed a social network chart, using Palantir technology, that shows 27 men allegedly involved in Daniel Pearl's kidnapping and murder. The Pearl Project is an innovative investigative journalism project at Georgetown University. The original investigation, conducted in 2007 through 2010, explored the kidnapping and murder of Wall Street Journal reporter Daniel Pearl in 2002. The 31-thousand word report was published by the Center for Public Integrity. During the academic school year 2007-08, The Pearl Project took shape as a six-credit seminar led by Barbara Feinman Todd, then the associate dean of journalism in the School of Continuing Studies, and former Wall Street Journal reporter Asra Q. Nomani, a professor in the practice of journalism. Nomani, Pearl's friend and colleague from his days at the Wall Street Journal's Washington bureau, rented the Karachi home where Pearl and his wife Mariane were staying at the time of his disappearance. After participating in the search to find Pearl, Nomani began the preliminary reporting and research for The Pearl Project. The project included graduate students from Georgetown's School of Foreign Service, Journalism graduate students, and Georgetown undergraduates from a variety of majors. Students in the seminar investigated the questions of who really killed Pearl and why they killed him. They also examined the wider relationship between the Muslim world and the press and profile others who have died in the frontlines of journalism. The project took place during the fall 2007 semester and the spring 2008 seminar. While the class came to a conclusion in May of 2008, a small team of students and fellows continued to work with the co-directors on the project through the fall of 2010. In the winter of 2011, their findings were published. At a time when investigative journalism is on the wane in the media industry, the Pearl Project is modeled after the Arizona Project, an investigative reporting project into the murder of Arizona Republic reporter Don Bolles three decades ago. The Pearl Project has welcomed the participation of journalists, media organizations, media outlets and sources from around the world. While our original investigation has been published, we are always interested in any new information regarding Daniel Pearl's kidnapping and murder and can be reached at pearlproject@georgetown.edu or (202) 687-7136. Since the release of the findings of the original Pearl Project, we have turned our attention to new projects and have acted as advisers to other journalism educators who are pursuing investigations at their universities. There are faculty-student investigative reporting projects emerging at universities around the world to fill the gap created by elimination of investigative reporting teams in this age of media consolidation. We remain committed to nurturing a new generation of investigative reporters trained in old school gum shoe reporting combined with new media expertise.